I’m back in markets this morning but only trading #2 today and Thursday since we’ll be live trading non-farm payrolls on Friday. Although the U.S. dollar has been very strong over the past few weeks, its pulling back with EUR, NZD and AUD leading the gains. EUR is up thanks to back to back improvements in EZ data. German retail sales came in much stronger than expected, the unemployment rate dropped to 5.2% from 5.3% and EZ economic confidence increased in the month of May. Is this enough for EUR/USD to bottom? Probably not with confidence votes in Spain and Italy at the end of the week but it is experiencing its strongest rally in nearly 3 weeks today which could continue in the North American session. This is particularly impressive considering that US Treasury rates are up sharply this morning, providing support for the dollar. The main catalyst for AUD and NZD strength is USD weakness because Australian and New Zealand housing data fell short of expectations overnight. Looking ahead, the US and Canadian dollars are in play this morning with ADP, revisions to US GDP and the Bank of Canada’s monetary policy announcement on the calendar. We’re starting the new trading week with stability. U.S. stock futures are pointing to a positive open after selling off sharply on Friday thanks in part to the recovery in Asian and European equities. Treasury yields are also pointing higher, supporting the rally in the greenback. The dollar is up against most of the major currencies with the exception of sterling and the New Zealand dollar. Investors still believe or at least hope that trade tensions between the U.S. and China amounts to nothing more than posturing as no sanctions have gone in effect and so far there hasn’t been further antagonism from China. The euro is under pressure from softer German trade data while the New Zealand dollar is benefitting from AUD/NZD, which has fallen to a 1 year low. Sterling on the other hand is up thanks to stronger house prices and a rise in Gilt yields. Keep an eye on the headlines as geopolitical risks remain the key focus -- we could get a NAFTA deal this week and increased tensions with China. Overnight we saw continued weakness in Asian and European equities but not currencies. USD/JPY is trading back above 105 as stock futures bounce off their lows and 10 year Treasury yields turn positive. Whether this level holds remains to be seen but the for the time being, there’s no signs of an ugly open that could send the dollar to fresh lows. China announced its own tariffs overnight and now that both countries have taken these antagonistic steps, there’s no doubt trade war tensions will worsen before they improve. The Canadian dollar is in focus today with CPI and retail sales scheduled for release. The U.S. has durable goods and new home sales which are far less market moving. Commodity currencies in general are outperforming European currencies with the New Zealand dollar leading the gains. The 2 currencies which have received the most attention this week -- the euro and Canadian dollar extended their slide. Otherwise we’re seeing a relatively quiet start to a firm week for the greenback. There hasn’t been much in the way of U.S. data on the calendar until this morning’s Q3 GDP report. The University of Michigan Consumer Sentiment index is also scheduled for release but these are final and not preliminary numbers so they will be less market moving. Economists are looking for softer GDP growth and US yields are slightly lower which explains the lack momentum in USDJPY or the greenback in general. However we believe that the report could beat expectations because retail sales and trade activity improved between July and September. Although U.S. yields are up only marginally this morning, the U.S. dollar is trading higher against most of the major currencies with USD/JPY leading the gains after PM Abe’s victory last night. 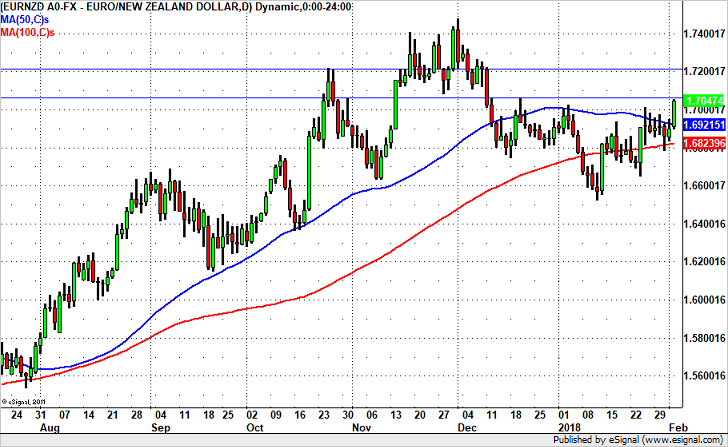 The deeply oversold New Zealand dollar is the only currency to hold steady vs. the greenback but after last week’s political developments, it still remains vulnerable to additional losses. The weakest performer is the euro. While the ECB is widely expected to announce tapering plans on Thursday, Spain’s political troubles are hurting the currency at the front of the week. The Bank of Canada also has a monetary policy announcement and the loonie is starting the week under a bit of pressure. Friday’s CPI and retail sales reports give the BoC very little reason to alter its less hawkish tone. There’s not much going on in GBP or AUD, which are slightly lower on the back of the rising dollar.